1 Meter /3 Feet USB 3.0 & 2 RCA Male to USB & 3.5mm Female Dashboard Panel Aux Extension Flush Mount Cable for Car Boat Truck Bike Motorcycle ect. This handy mountable USB extension can be used to either provide a flush mounted USB input on your dash or other surface. 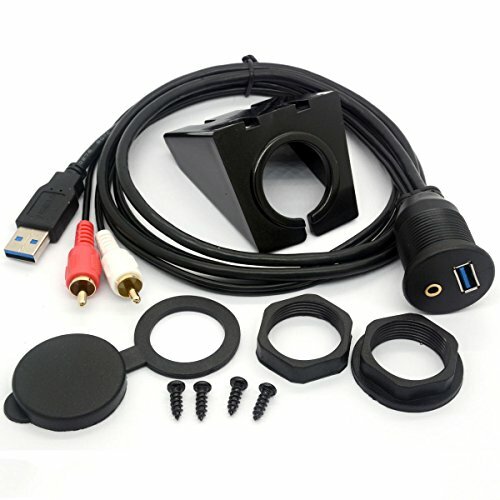 This 3.5mm/USB extension mount is designed for in car/Boat/Bike/Trailer use and is compatible with any car stereo Boat or Bike equipped with a 3.5mm/USB Aux Input. High speed USB 3.0 flush cable,Compatible with standard USB devices up to USB version 3.0, also works for USB 2.0 and USB 1.1. USB Male to Female Socket promise high speed data transfer or power and fast charging. The 2RCA Audio Video Female to 3.5mm aux port could meet your need of audio transmission, 1/8 audio jack allows input of any car stereo / gps / android / wince / head unit/ DVD CD Media Player with 3.5mm AUX & USB Input, make you enjoy music. 2) Mount to dash using the bracket and screws see the picture Can be plugged into any car stereo equipped with a AUX input.